A mysterious alien force is making a beeline towards Earth and this starbase is the best chance for the New Terran Federation to establish new alliances, research new technologies and otherwise figure out a way to stop the impending invasion. Using only the resources you can salvage from the derelict station and gathered from nearby star systems, it’s up to you to rebuild the starbase to lead the Terran Republic’s scientific research, exploration and diplomatic efforts on the edge of known space. Halcyon 6 is developed by Massive Damage. Hyper Light Up reviewed the game back in December. Since then, Halcyon has gotten a Lightspeed Edition, and we are eager to see what’s new! 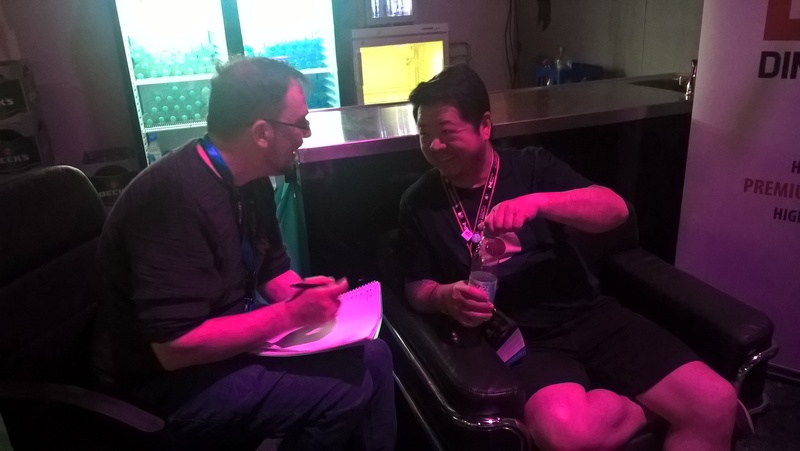 We had the pleasure of talking with Ken Seto, the chief executive officer of Massive Damage at Gamescom and he told us a lot of interesting things about the new edition of Halcyon 6. For those that don’t already know, this Lightspeed Edition offers an overhaul to the base game and changes the experience. When we asked Ken how come this version comes completely free to the players, he told us that this comes from the company’s background from mobile games. Ken told us that one of their previous successes was Please Stay Calm, a mobile MMORPG and through this experience they have leanred how to interact with players, to listen to feedback and that success came from this communication with the players. They learned how to find a balance between staying true to the vision and listening to feedback while looking everything objectively. They took this approach with Halcyon 6 in a process that took them six months of development, including design and testing. The biggest changes according to Ken have to do first and foremost with the new UI that includes new info design. At the same time they rebalanced the game’s economy and automated a lot of the grind that was in the earlier version of the game. Finally, they completely changed the officer skill set. Now they offer six main classes plus prestige classes for the player to chose when they reach a higher level. Ken mentioned that they didn’t feel justified to charge the already existing playerbase. When it makes sense they will do it, if they offer a new storyline in the future for example. At the moment Halcyon 6: Lightspeed Edition offers twelve to fifteen hours of gameplay depending on playstyle and the team is working on making the game better through updates. These will come out in slower speed because Massive Damage is also working in a new game. Ken told us that those players who enjoy Halcyon 6 will feel like home with their new project. We can expect a trailer probably this fall. We surely can’t wait to revisit Halcyon 6 with its new edition. For more information, you can check out Halcyon 6 through the game’s Facebook and Steam page.